Vietnam is a hotbed of illegal wildlife trade activity. Wildlife and wildlife products collected throughout Southeast Asia, especially Malaysia and Thailand, move through Vietnam en route to markets in China. Because the economy is growing in Vietnam, the country is also increasingly an end market for wildlife products with their sale often occurring in the open in restaurants, bars, hotels, and markets. Live animals are also frequently sold for both foods and pets. In an attempt to counter this growing problem, a Vietnam-based organization, Education for Nature-Vietnam (ENV) was established in 2000 as Vietnam’s first non-governmental organization promoting wildlife conservation. Their mission is to foster greater understanding among the public about the need to protect Vietnam’s rich natural heritage. ENV hopes to reduce the trade in animals and animal products through their Wildlife Trade Program. As part of this program, ENV produces public service announcements, exhibitions, and a radio program renouncing wildlife use. They also manage a Wildlife Crime Unit that operates a wildlife trade hotline and investigates violations in conjunction with the Vietnam Forest Protection Department. They monitor wildlife trade cases and their resolutions through a comprehensive database and also campaign for changes in wildlife trade laws. Current law allows sick and dying animals (i.e. non-releasable) to be re-sold back into trade – even endangered species. Therefore many confiscated animals are classified as sick and sold back to dealers, thereby re-entering the wildlife trade. 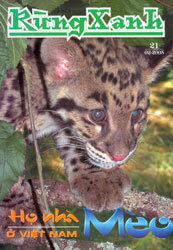 In 2006 a live clouded leopard was confiscated and ENV assisted with its placement in a wildlife rescue facility. ENV puts much effort into stemming the wildlife trade through their environmental education programs. One component of ENV’s outreach efforts is targeting villages surrounding Tam Dao National Park. These poor, remote villages have a high proportion of resident poachers of both wildlife and forest products. 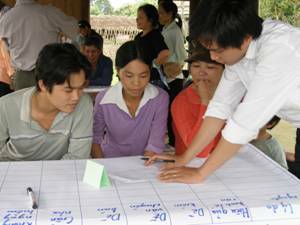 ENV facilitates community meetings of village leaders and residents with ranger-led discussions of forest resource use and habitat degradation. Other ENV programs include training for park staff in Cuc Phuong and Tam Dao National Parks, school outreach and camp programming, urban environmental awareness programs in Hanoi, and their Environmental Education Family Network that distributes educational materials (magazines, newsletters, posters, etc.) throughout Vietnam. In Vietnam, there are limited resources about nature and the environment available to students, especially in remote areas. By partnering with environmental education programs offered in national parks and other protected areas, ENV is able to distribute thousands of these materials free of charge. Some of ENV’s most popular and widely distributed educational materials are their Green Forest activity books, given to students living along the borders of environmentally rich and important areas. ENV has produced Green Forest books since 2000, each with a specific wildlife theme including Biodiversity, Endangered Species, Wildlife Trade, Turtles of Vietnam, and The Tropical Forest. The Clouded Leopard Project awarded a grant to ENV to help fund the publication of Cats of Vietnam, released in September 2004.